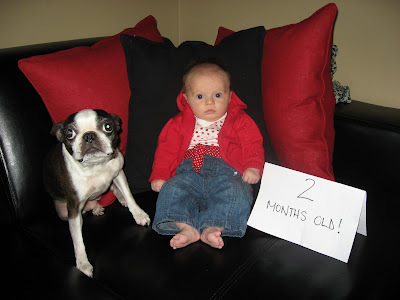 Ruby is two months old today. Happy 2 months to Ruby! She's a cutie too! Happy 2 Months, baby girl! It goes quick, don't it? Yippee!! I just realized I could click on the pic and enlarge it. What a complete and utter beauty she is! And Quincy is not too bad either. I can't believe it's already been 2 months! She's darling and so is the dog! My favorite color is red too and I think your couch looks great!